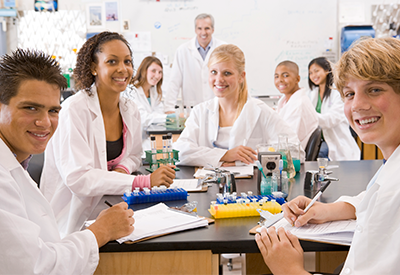 Science, Technology, Engineering and Mathematics (STEM) education has become a major priority in the United States. As the U.S. secondary education community races to improve diminishing educational performance in science and mathematics, school districts around the country are investing in scientific education by building gleaming, state-of-the-art science centers to educate future generations of Americans. As American high schools increase the percentage of campus real estate dedicated to scientific studies, one significant challenge will emerge…...properly managing chemical waste in high school chemistry labs. Many districts lack well defined protocols and an understanding of complex environmental regulations for the disposal of spent or expired chemicals. This can lead to frustration for high school teachers and district staff, who may not have a chemistry degree or be unfamiliar with procedures to safely store, handle and dispose of hazardous waste streams. It can also lead to big fines and negative publicity for teachers and school district personnel that are ignorant of the laws. In this article, we will look at some of the issues facing educators, and information on how to establish best practices when dealing with chemical waste disposal. According to the American Chemical Society, “chemical inventories found in high schools contain a vast array of chemicals ranging from safe and suitable for education at the secondary level to extremely hazardous, unsuitable and inappropriate for those unknowledgeable or untrained in their use and potentially harmful to the environment. When dealing with hazardous chemicals it is important for high school science teachers, school administrators and district personnel to understand that these toxic substances are required to be disposed of according to the Resource, Conservation and Recovery Act (RCRA). According to RCRA, hazardous waste generators which schools would be considered when disposing of toxic substances in chemistry labs have cradle to grave responsibilities. What this means is if you generate hazardous waste, you can and will be held responsible for its improper off-site transportation and disposal. Schools and school districts are NOT exempt from RCRA requirements and can be fined by the Environmental Protection Agency (EPA)!! When Should Chemicals Be Disposed? Expired Chemicals - Many chemicals come with expiration dates, or at a minimum of timelines for disposal. It is important to maintain a proper inventory of chemicals and their expiration dates. If your facility is ever subject to a regulatory inspection, storing expired chemicals is low hanging fruit for regulatory fines. Degraded Chemicals - High school chemistry labs are busy places with lots of students handling substances on a regular basis. If water finds its way into chemical bottles, or containers are not sealed properly, it is a signal that some chemicals should be sent for disposal. It is important to periodically inspect inventory and find problem containers. 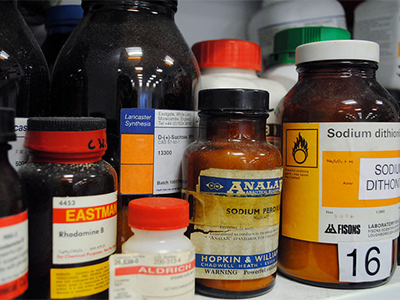 No Longer Used - There are many laboratory demonstrations that are no longer relevant or used in modern chemistry labs, however, you may still have chemicals that are leftover from year’s past. During your regular inventory, keep track of the chemicals that you use in demonstrations, and dispose of those no longer required. Dangerous Chemicals - Some chemicals pose significant hazards that may outweigh the benefits of being maintained in chemistry labs. The American Chemical Society’s Committee on Chemical Safety (CCS) formulated a series of recommendations with recommended restricted use chemicals. Click here to download a copy of the list. It should always be the practice of those using chemicals in their laboratories to minimize risks from exposures while at the same time recognizing the benefits of proper educational use of chemicals. Chemicals utilized in experiments and demonstrations are appropriate to the plan and safe for student use. Students are trained in the proper use of personal protective equipment (PPE). Students are trained in the environmental impact of chemicals. Chemicals classified as extremely or very hazardous by the GHS (Hazard Class 1 or HC1) or could be used as illegal drug precursors should not be stored, used by, nor available to high-school students. These chemicals include explosives, carcinogens, mutagens, teratogens, etc. If needed to educate students, these chemicals should be handled or used only by science educators who are fully trained in their safe handling for demonstrations or in preparation of dilute solutions, such as the dilution of concentrated acids. Store minimum quantities of chemicals approved in the chemistry or science education plan. Restrict access to storage areas by students. Prohibit storage of HC1 chemicals, except as needed for demonstrations (demonstration quantities) by educators trained in their use. Utilizing appropriate safety precautions (e.g., PPE, ventilation). Only using the minimum quantities of chemicals necessary for the demonstration. With the demand rising for STEM educators, many schools will find themselves with the dilemma of filling open positions with candidates that may not have a full background or degree in chemical sciences. This means that more educators may not fully possess the tools to manage these inventories properly, and dispose of these waste streams in accordance with EPA and state regulations. It’s important to find a vendor that is fully licensed and experienced in working in an educational environment to ensure that your school does not end up on the nightly news because of an accident, or regulatory incident.